Bustle suggests sending thank you notes to Hillary. 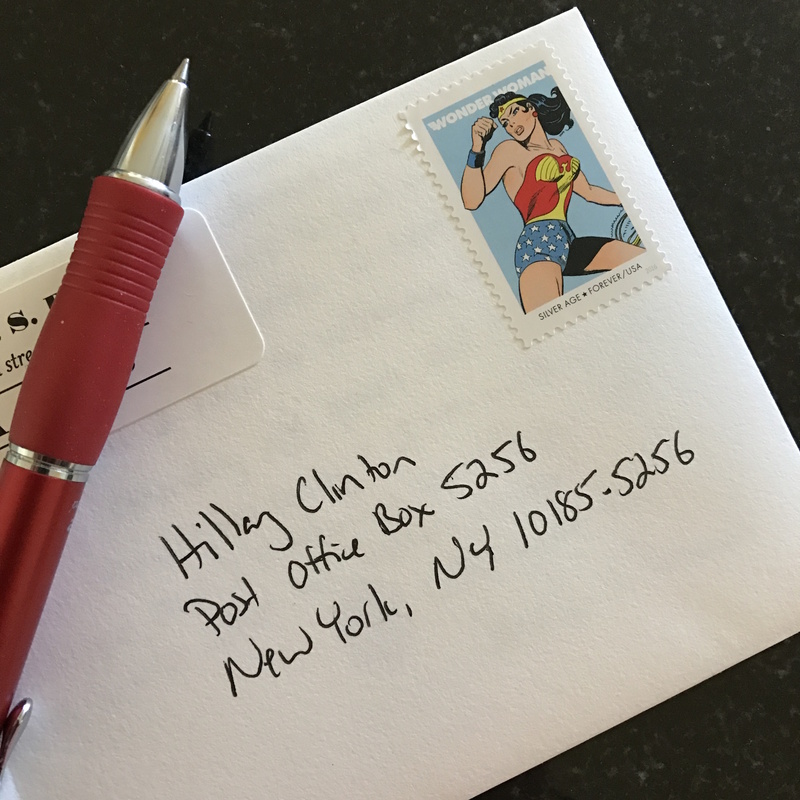 I can’t think of a better use for my Wonder Woman stamp. In 1952, Ray Bradbury published in Collier’s one of my all-time favorite short stories, “A Sound of Thunder.” I won’t be able to do the story justice, so you should go read it (search for it online; I won’t link because I don’t know if they’re legit reproductions), but the story takes place in 2055 when the rich are able to travel back in time to hunt true big game: dinosaurs. A hunter, Eckels, takes the trip, even though he’s told it’s incredibly dangerous. Elections occurred the day before; the moderate candidate, Keith, has just won the presidency over a fascist candidate; and Eckels is confident in his abilities, so he goes. He’s warned that one cannot veer off the set path, because even the tiniest change in the past can set off waves in the future. Killing one mouse kills a family of mice, killing off millions of mice (all its descendants), which means foxes could starve, meaning tigers have nothing to eat, and the early human who depends on that tiger for game will die, killing off millions of future people (okay, not eloquently put, but you get it). Each game dinosaur is traced so that it is killed moments before it would have died naturally, thereby not setting off future repercussions. When Eckels ultimately faces his T. Rex, he panics. He sets off in the wrong direction, accidentally stumbling off the path and into the dirt of prehistoric times. Upon his return to the year 2055, the very air around him feels subtly different. On the bottom of his shoe is is a small prehistoric butterfly that he accidentally killed. When he asks the person at the desk who won the election, he’s told, “You joking? You know very well. Deutscher, of course! Who else? Not that fool weakling Keith. We got an iron man now, a man with guts!” The story is quite powerful. Please read it despite my bumbling summary. There’s more to it. On Wednesday morning, when I woke up to the New York Times headline “Trump Triumphs,” all I could think was, “Who the f* stepped on a butterfly?” My mind couldn’t process it. It was a scene from a dystopian book or film, an alternate history a la The Man in the High Castle. This blog is not intended to be about politics. And had the election gone the way I’d hoped, I don’t think I’d ever be discussing politics here. Given the way things turned out, though, politics will make an occasional appearance. Not too much, I hope. I’d much rather write about writing and books and my family and genealogy. But I can’t stick my head in the sand. Donald Trump will be my president. There’s no denying that no matter how much people may hope for electoral college miracles. So I’ll just have to make sure my voice is heard. It’s not simply the many acts of hatred occurring that disturb me; what truly shocks me is that this was lurking beneath the surface of so many people for all these years and I simply didn’t know. I’ve always lived in liberal cities on the coasts; I thought most of the hatred was gone. What a sorry lesson for me to have to learn. This election has been a punch in the gut, wrenching me from my safe little nest. I was naive, but my eyes are now wide open. As a Jew and a woman, I feel threatened, but it pales in comparison to what it must feel like to be an immigrant, a person of color, a Muslim, or an LGBTQ. My friend Ron Fein wrote a powerful post on Facebook: “[A]uthoritarianism usually doesn’t happen overnight. It comes in stages, and, like the proverbial frog in the pot of slowly boiling water, at each new move we can rationalize.” He suggests writing down the scenarios you think are improbable and what you’ll do if they occur, so you don’t become desensitized. Read his post and get on that. What else have I done? I’ve made monthly donations to Planned Parenthood, the Planned Parenthood Action Fund, and the ACLU. I’m making sure we open conversations with my kids. I’m commiserating with my friends. I’m planning on attending the march in Washington, D.C., in January, not to claim he’s not my president, but to make sure that he knows that reproductive rights, women’s rights, LGBTQ rights are important to me, that I think people should be able to live confidently, happily, and safely in this country no matter their religion or color or immigration status. And I’m going to see what happens. I’ve been grieving all week, and now I need to move on. Accept what is happening and remain vigilant, but return to my life. I need to continue writing, continue mothering, continue running, and all the other things that make up my life. We can’t let this election defeat us, and if we give up what means most to us, it will have. We need to be strong. We need to move forward. We need to keep doing the things in life that give us passion. Love trumps hate. Simple as that. This was a very good post. I completely agree with you. As a woman, member of the LGBT community, and member of a multiracial extended family, I can’t deny that I’m scared. There may be dark days ahead, but we’ve got to keep fighting. Love will trump hate in the end. You are not alone, Lydia! Knowing there are likeminded people out there is comforting to me. I hope it is to you, too.